The Victorian period was a time of progression both technologically and socially. The last three decades of the 19th century witnessed a growth in the proportion of the literate population, education was made compulsory for children aged between 7 and 10 years old and adults took a greater interest in learning. A variety of educational colleges were opened some like working men’s clubs offered instruction in the primary skills of reading, writing and arithmetic, these clubs charged just a few pence per lesson. 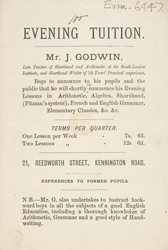 Those with more money could afford to visit a private tutor like J. Godwin, featured on this leaflet. Here a wider curriculum was available with suited the lower middle classes who wanted to progress socially.